Note 1: Like basketball games? Check out my review of Dunk Dream! 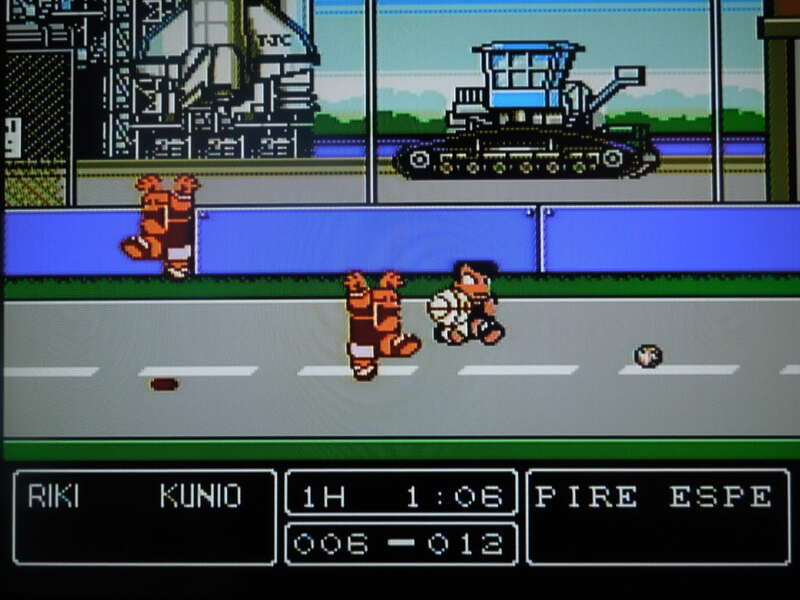 Quick History: Nekketsu Street Basket: Ganbare Dunk Heroes was released for the Famicom (Japanese NES) in 1993. The game never received an official translation or release outside of Japan. In the Nekketsu series of sports games for the Famicom (including ice hockey, soccer, dodge ball, fighting, and others), Ganbare Dunk Heroes was the last game released for the system. Since then, the game has been (partially) translated and put on NES cartridges, and today, NES reproduction websites sell the game. 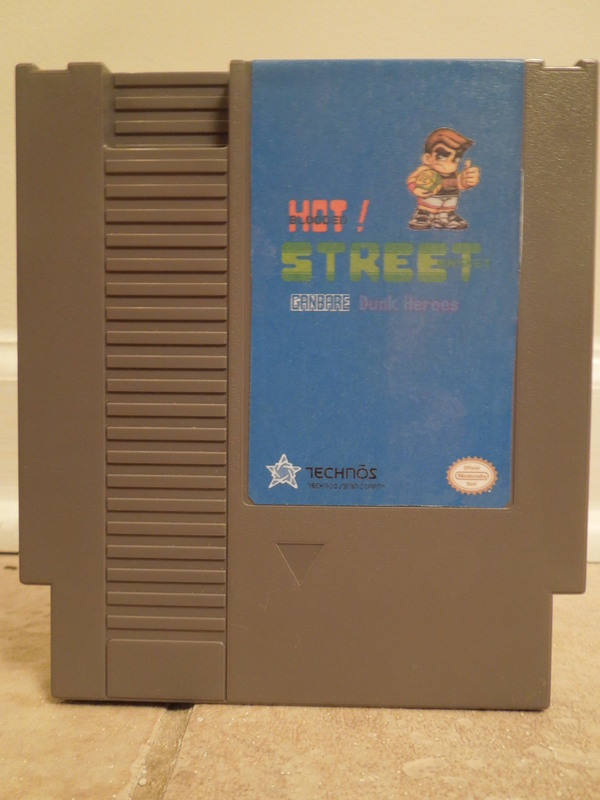 This review is for an NES translated reproduction cartridge of Ganbare Dunk Heroes. 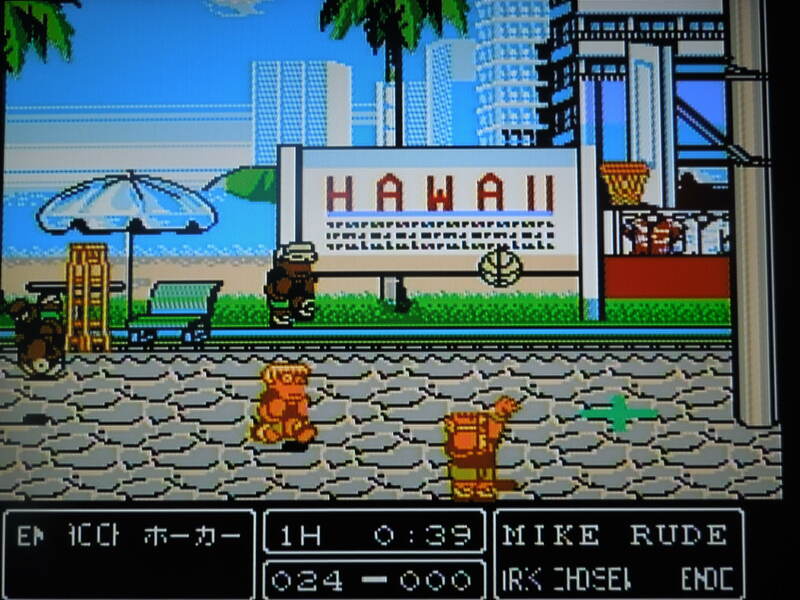 Story: Kunio-kun, the main character in all Nekketsu games, wins a quiz-show contest and his prize is a two-week vacation to the United States. His friends Riki and Godai tag along, and along with Jonny (who is evidently already in the States), the 4 enter a U.S. basketball tournament. Modes: 2 ‘modes’ exist in the game: Story Mode and Battle Mode. -Story Mode is for 1 player or 2 player co-op, and as Team Nekketsu (Kunio, Riki, Godai, Jonny), you take on the game’s other 7 teams. You must beat each team twice – once on their home court and once on your home court, which is in Niagara Falls, Canada. You can choose to play the other teams in any order that you wish, and an airplane will fly you to their U.S. destinations, or fly them to your home court in Niagara Falls. After every win, you’ll get a 6 digit password, meaning you don’t have to beat the game in one sitting. -Battle Mode is for 1 player or 2 players (VS). For 1 player, you first select any of the game’s 8 teams as your team, then select a CPU opponent to face. In 2 player VS, player I selects a team, then player II selects a team for a game (you cannot select the same team). *Note: Battle Mode has an option for 3 players or 4 players, but this option, unfortunately, cannot be activated on this reproduction cartridge. I believe you can only play with 3 or 4 players using the original Famicom cartridge of Ganbare Dunk Heroes, a Famicom (Japanese NES) console, and an appropriate Japanese multi-tap device. Each team has their own unique play-style. 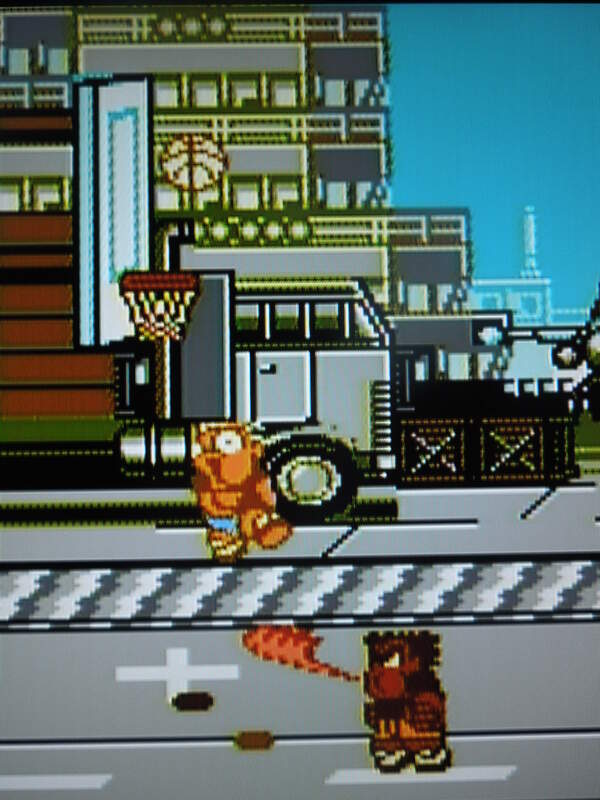 Gameplay: In either Story Mode or Battle Mode, you play 2 on 2 basketball games, Nekketsu style. Each game is split into two 3-minute halves. There are no timeouts, foul calls, or injuries. Before each game, you select which 2 of your team’s 4 players you want to be your ‘Starters’. Each player has different strengths and weaknesses, broken into 5 categories: Energy, Power, Speed, Jump, and Shoot. The higher the ‘bar’ beside each category, the better your player is at that attribute. Once you pick your two players, you select from 5 ‘play styles’ – Attack, Mark Him, Nice Play, Anything, Defense. These play styles mostly determine how your computer-controlled partner will behave (if you’re playing with 2 human players in co-op Story mode, this selection essentially becomes irrelevant). In my experience, Nice Play is the best selection, as your computer-partner will consistently attack your opponents and go for slam dunks when he has the ball. Controls: B shoots with the ball, or tells your computer partner to shoot. A passes with the ball, or tells your computer partner to pass. On defense, A punches and B kicks. Pressing A or B near an on-court object (like a box) picks it up, and A swings it. Pressing A + B jumps, and a ‘double jump’ can be achieved by pressing A + B again once you’re airborne. Pressing a quick Toward, Toward runs, and pressing Up, Up or Down, Down while running causes a juke/spin move. You can also jump on your teammate’s shoulders, and he carry you and launch you towards the goal. Choose your two best players before each game. 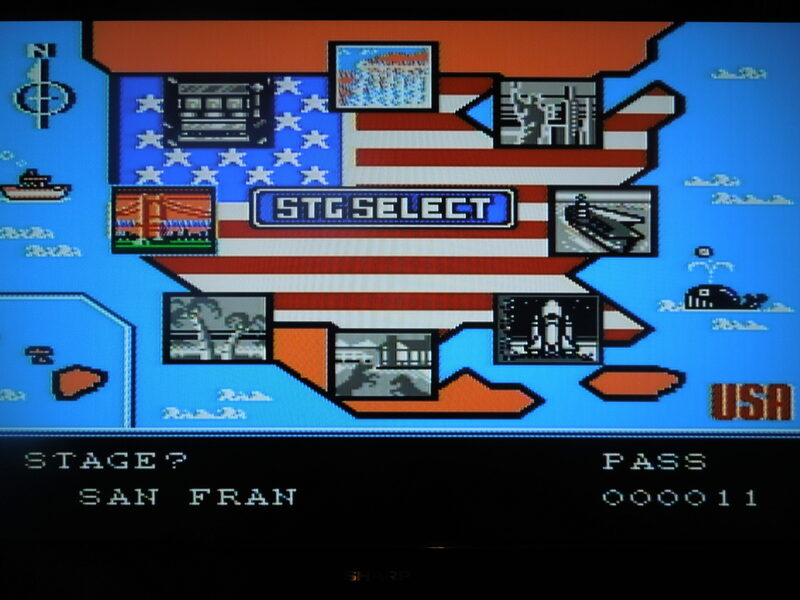 The Teams: The 8 teams in the game are Team Nekketsu, Florida, Hawaii, Las Vegas, New York, San Francisco, Texas, and U.S. Navy. Each teams’ players look distinctly different, and each individual player has their own unique ‘attack’ moves and Super Shot. Additionally, each team has their own distinct home court. For example, the U.S. Navy plays on an air craft carrier and Texas plays on a ranch. Courts have certain interactive features that can be utilized by either you or your opponents as well. For example, in New York, you can run into the Underground Subway Station and come out on the other side of the screen; in Texas, you can run into a horse to get kicked towards your goal for a slam dunk. In Story/Season Mode, you have to beat each team twice. 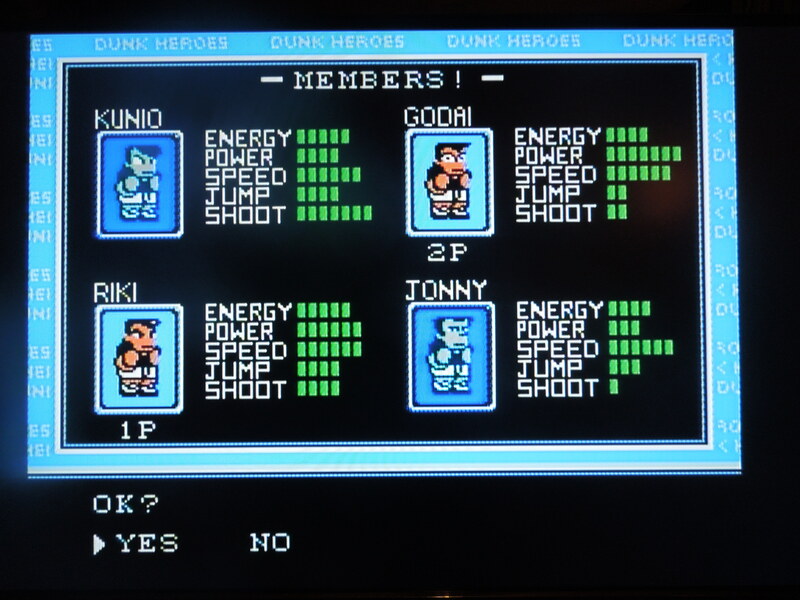 Scoring: Unlike traditional basketball, Ganbare Dunk Heroes has 6 hoops instead of 2 – three for each team to shoot on. A super high top hoop, a mid-height hoop, and a regular-height hoop are all available for you to shoot on. To shoot on the mid-height and high-hoop, you need to double jump or hold the shoot button for a few seconds. The highest hoop nets you 4 points, while the lower two hoops get you 3 points. It is possible (and happens often) to have a 12-point play if you shoot the ball through the top hoop and it goes through all 3 baskets. Unlike regular basketball, an automatic change of possession doesn’t happen after a score either. Instead, if you score, you continue playing. So, if you score, try to grab the ball and put it right back up to try and score again! This fast-paced style of play makes for high scoring matches. Also, if you or your opponent score often, one of your hoops can fall down. If this happens, simply pick it up and ‘shoot’ it at the backboard and it will re-stick. Each team has 3 baskets to shoot on. Music & Sounds: Ganbare Dunk Heroes has excellent music and sound effects. Different themes play depending on the court that you’re playing on, and the sound effects for dunks and attacks greatly add to the frantic and fast-paced action of the game. So, where can I find this game? The original Famicom Ganbare Dunk Heroes didn’t receive a high-production run, but can still be found on eBay. NES reproduction websites sell (partially) translated versions of the game, like the one used in this review. The game’s only partially translated? Yes, or at least my copy is, and I believe it’s the only translated version that’s been created. Most of the important stuff is translated however, including the Story and the statistics of each character. One thing that was not translated from Japanese that should have been, however, was the ‘equipment’ you receive after you win a match. You can still equip these stat-boosting items easily, however, and you’ll know if it’s beneficial or not if your statistical bars increase or decrease. 8 unique courts add to the game’s replayability. 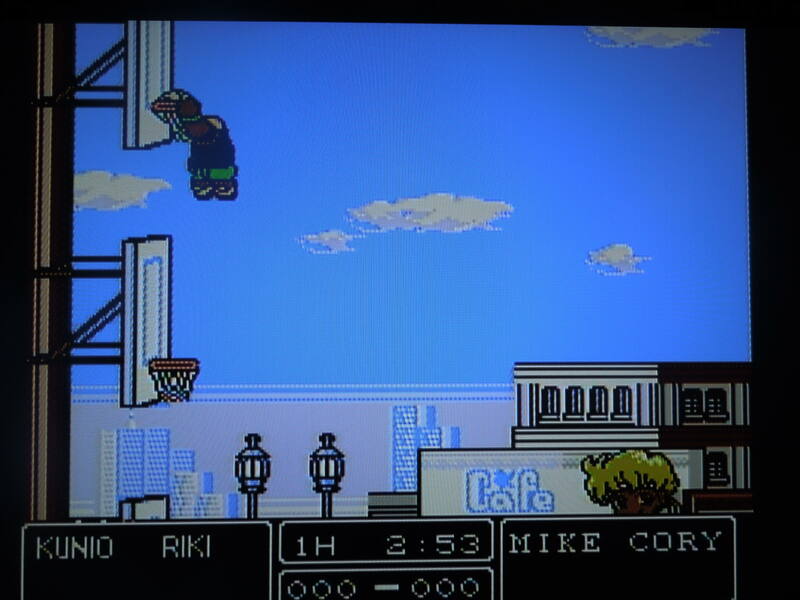 Conclusion: Ganbare Dunk Heroes is perhaps the best basketball game on the NES. It far outshines, in my opinion, more well-known games like Double Dribble or Arch Rivals. While it greatly exaggerates the game of basketball with multiple hoops and fighting elements, it’s still basketball at its core. The addition of a 2 player co-op Tournament/Season mode is a great one as well, as too often sports games only included VS modes for 2 players. Another element that makes this game stand out is the ability to play as any team in the Battle Mode without having to have more than 1 player. In other Nekketsu sports games, often the only way to play as the game’s other teams was to have at least 2 players – not so with Ganbare Dunk Heroes. On the downside, the game does flicker sometimes, although not terribly, when too many sprites appear on screen (nothing like the flickering in Super Dodge Ball, if you’re familiar). Also, the incomplete nature of the translation is unfortunate, although it doesn’t affect gameplay. This entry was posted in NES - Nekketsu Street Basket and tagged Nekketsu Street Basket: Ganbare Dunk Heroes Review (NES). Bookmark the permalink.